If the election were held today, President Obama would win more than 52 percent of the popular vote, an increase that could be attributed to the release of Mitt Romney’s “47 percent” video, according to political calculus done by Nate Silver of The New York Times‘ Five Thirty Eight blog. By Sept. 17, the date when the video of Mr. Romney’s remarks was released and received widespread attention, the momentum from Mr. Obama’s convention appeared to have stalled (although not necessarily reversed itself). 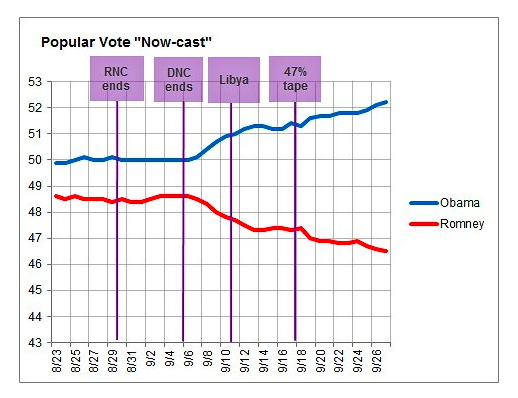 Mr. Obama led in the popular vote by 4.1 percentage points on that date, according to the “now-cast.” Since then, however, Mr. Obama has gained further ground in the polls. As of Thursday, he led in the popular vote by 5.7 percentage points in the “now-cast,” a gain of 1.6 percentage points since Mr. Romney’s remarks became known to the public. Silver’s chart, below, does not include the effect of the national conventions or economic trends, which makes it useful for looking at the isolated impact of the Romney videos on the 2012 presidential election. Nate Silver, The New York TimesOver the coming weeks, political pundits will likely be interested in seeing an updated version of this chart, as Romney continues to feel the aftershocks of his remarks.